About a week before the Olympics started, I was sitting in my favourite local café, working on some project or another, as I tend to do, when two French-speaking journalists walked in, one of whom was carrying an enormous camera. They had a chat with the barista and started setting up. I wondered what was going on. After a few minutes, they came back to explain that they were doing a piece on the café, which has been asked to remove its 5 bagels from the window, as they had been hung up in a shape that looked suspiciously like the Olympic rings. I saw the bagels in the window – in fact, they were still there and had not been taken down – they did indeed look very olympic and festive, something I appreciated. I thought it gave the café a great festive feel as we all participated in this momentous event coming to London together. But the barista came back a few minutes later to explain to us clients a bit more about what was going on, and in that conversation I learned that the London2012 symbol, and everything related to it, have been consecrated to that entity. It’s possible I’m not actually supposed to be using the phrase “London2012” in this blog. Oops. But I’m not making money off of this. But then again, neither was the café – its proceeds go to charity. Hmph. Anyway, in East London during the Olympics, any place that sold chips, aka french fries, other than McDonalds, was barred from doing so during the Games. Ummm… that means that tourists near the Olympic Park couldn’t eat authentic Fish and Chips! Sad. I also heard of a butcher who had hung up sausages in the shape of 5 interlaced rings, who was also asked to remove them. First of all, local businesses getting caught up in the spirit of the thing make the entire neighbourhood feel more festive. Second, the world is in an economic crisis and the Olympics are supposed to help boost the local economy, aren’t they? Isn’t this a good thing? 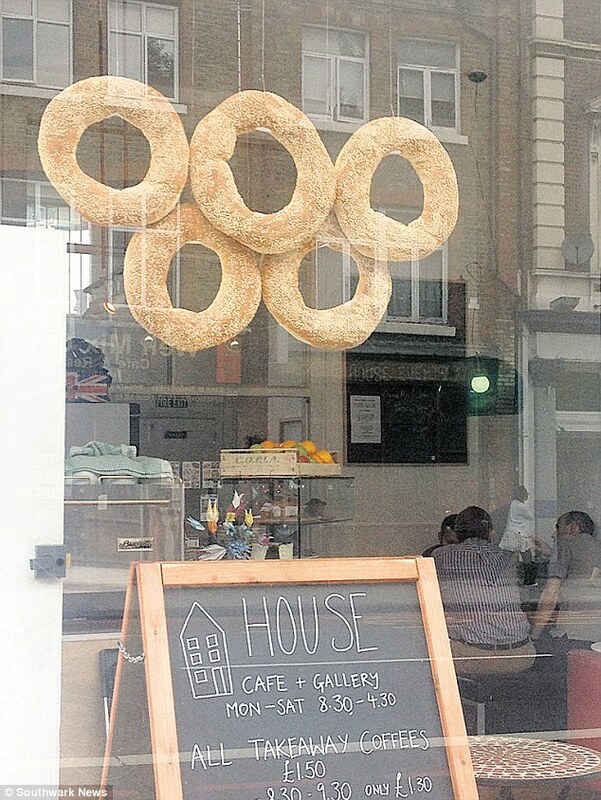 Third, I think a local café hanging bagels in the shape of the Olympic symbol gives free publicity to the Olympics, not the other way around. Ugh. This tempted me to stay away from the Olympics, but it was too exciting and, really, this is one of the only things I have to complain about; otherwise it was such a happy and unifying occasion! This entry was posted in adjusting to London, Causes and tagged local business, London2012. Bookmark the permalink.